Alabama's ALTS (Alabama Title System) is a web-based title application system that permits designated agents of the Alabama Department of Revenue to access a secure website and complete a title application online [more info]. In order to start processing your titles electronically, you will first need to contact the Motor Vehicle Division of the Alabama Department of Revenue to register your business. The State will provide you with a user name and password that will allow you access to ETAPS network. 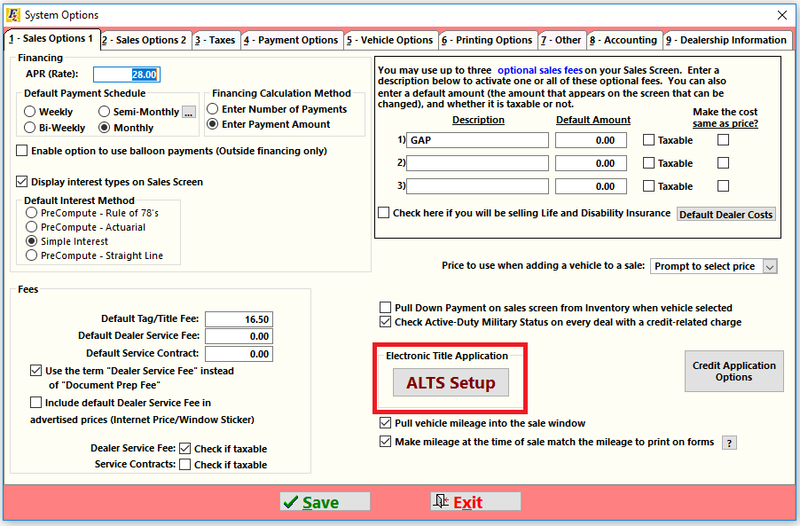 Enter your user name and password in System Options > Sales Options 1 into the box labeled "Electronic Title Application." Open Forms Printing and click "Electronic Title App" and click "Submit to ALTS". You will complete the process on the ALTS side.